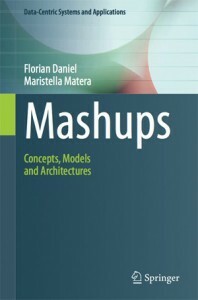 Mashups: Concepts, Models and Architectures (Springer 2014), F. Daniel and Maristella Matera. Mashups have emerged as an innovative software trend that re-interprets existing Web building blocks and leverages the composition of individual components in novel, value-adding ways. Additional appeal also derives from their potential to turn non-programmers into developers. This book is the first comprehensive reference work for mashups. It systematically covers the main concepts and techniques underlying mashup design and development, the synergies among the models involved at different levels of abstraction, and the way models materialize into composition paradigms and architectures of corresponding development tools. The book deliberately takes a balanced approach, combining a scientific perspective on the topic with an in-depth view on relevant technologies. The first part of the book introduces the theoretical and technological foundations for designing and developing mashups, as well as for designing tools that can aid mashup development. The second part then focuses more specifically on various aspects of mashups. It discusses a set of core component technologies, core approaches, and architectural patterns, with a particular emphasis on tool-aided mashup development exploiting model-driven architectures. Development processes for mashups are also discussed, and special attention is paid to composition paradigms for the end-user development of mashups and quality issues. Overall, the book is of interest to a wide range of readers. Students, lecturers, and researchers will find a comprehensive overview of core concepts and technological foundations for mashup implementation and composition. Even without low-level coding details, practitioners like software architects will find guidance on key implementation concepts, architectural patterns, and development tools and approaches. A related website provides additional teaching material which can be used either as part of a course or for self study. “This book is timely, provides a through scientific investigation and also has practical relevance in the general area of composition and mashups. It is of particular interest to researchers and professionals wishing to learn about relevant concepts and techniques in service mashups, composition, and end-user programming.” – From the Preface by Boualem Benatallah, University of New South Wales, Sydney. Visit the book site for further info and material. Engineering Web Applications (Springer, 2009),with S. Casteleyn, F. Daniel, P. Dolog. Progettazione di Dati e Applicazioni per il Web (McGraw-Hill, 2003, in Italian), with S. Ceri, P. Fraternali, A. Bongio, M. Brambilla, S. Comai. Designing Data-intensive Web Applications (Morgan Kaufmann, 2002), with S. Ceri, P.Fraternali, A. Bongio, M. Brambilla, S. Comai.